Here you'll find solutions or explanations for some commonly reported problems with GWX Control Panel. If you can't find the answer you're looking for, have a look at the GWX Control Panel user guide or the GWX Control Panel Frequently Asked Questions. New versions of GWX Control Panel often include improvements and fixes based on feedback I've gotten from users. Please be sure you're running the latest version of the program in case the problem you're having has already been addressed. You can head to the download page directly, or use the Check for updates feature in the right-click pop-up menus of both GWX Control Panel's Monitor Mode icon and the title bar of the main program window. UPDATE (May 5, 2016): In the past two weeks I've received four reports of this happening, even with the latest version of GWX Control Panel. Some new third party tool or Windows Update patch is altering the registry security settings on some peoples' computers in a way that prevents GWX Control Panel from writing the registry settings that protect you from Windows 10. 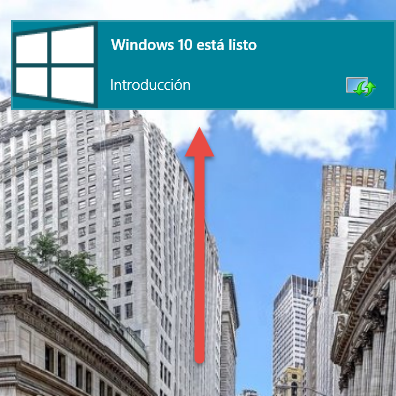 You can click the "Click to Prevent Windows 10 Upgrades" button, but after a few seconds, the "Are Windows 10 Upgrades allowed?" field still says Yes, and the button text still says "Prevent Windows 10 Upgrades," indicating that your computer settings haven't changed. "ERR, code: 5, Failed to prevent Windows 10 upgrades in Windows Update policies." If you open up Registry Editor (regedit.exe) and attempt to create one of the Windows 10-blocking registry values yourself (for example, the DisableOSUpgrade value under HKLM\SOFTWARE\Policies\Microsoft\Windows\WindowsUpdate), you receive an error message that says: "Cannot create value: Error writing to the registry." In the Windows File Explorer, locate the downloaded DisableWindows10Settings.reg file and double-click it. If Windows asks, "Do you want to allow the following program to make changes to your computer?" click Yes. When a Registry Editor dialog box appears asking, "Are you sure you want to continue? ", click Yes. If any of the three entities listed above are missing, you must restore them. To do this, click Add, then type the first word in the group's name under Enter the object names to select, and then click Check Names to look up the full correct group name. 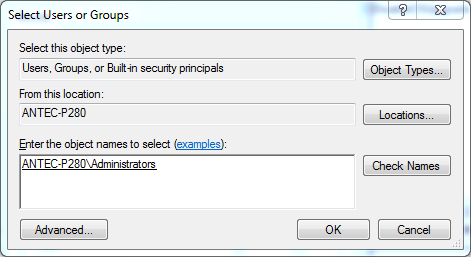 Next, click OK.
Once the group is added, make sure it has the appropriate permissions as described in step 7. Click OK to quit Registry Editor, and then launch GWX Control Panel. You should have full control over your computer again. The overwhelming majority of GWX Control Panel users do not experience this problem (and I'm not able to reproduce it here yet, since I don't know what's causing the permissions to change), but I'm planning to address the issue in the next update. Check the downloads page to see if there's a new version available. GWX Control Panel looks for two different potential locations for downloaded Windows 10 files on your system drive. One folder is named $Windows.~BT and the other is $Windows.~WS. They only exist on your computer if Windows has tried one or more methods of downloading the files to your PC. GWX Control Panel always (as far as I know) deletes the $Windows.~BT folder, but I have heard of some cases where it couldn't delete $Windows.~WS. After taking a look at the code, it looks like there's a bug in 1.7.x of the program where it accidentally skips the $Windows.~WS folder if $Windows.~BT is not found. This bug will be fixed in the next version of the program (I've already updated the code), but in the mean time, you can work around the issue by browsing to the root of your system drive (usually C:\) and creating a new folder called $Windows.~BT. Place a single file in the folder- even a little TXT file will do. Now when you use the Delete Windows 10 Download Folders button in GWX Control Panel, the program should find and remove both directories. Sorry for the confusion! Select your system drive (usually C:) if/when prompted to choose a drive. Click the Clean up system files button in the Disk Cleanup tab. After a minute or two, the Disk Cleanup tab will reappear. Locate and check the Previous Windows installation(s) option, and then click OK.
3. ONE OF THE BUTTONS SAYS "ALLOW WINDOWS 10 UPGRADES" BUT I DON'T WANT ANY WINDOWS 10 UPGRADES! Don't worry! If the button starts with "Allow" that means upgrades are already being prevented. If you had any Windows 10 upgrade settings, the button would actually say "Prevent Windows 10 Upgrades." The upper "Information" section of the program is your computer's current status. The lower area with the buttons is where you can perform actions described on the buttons. Look at the Information section for your current status. Use the buttons to perform actions. 4. WHY CAN'T I CLICK ONE OR MORE OF THE BUTTONS? Some buttons become available or unavailable depending on the current state of the 'Get Windows 10' app or certain files and settings on your computer. See the user guide to learn when they're unavailable. 5. WHY DOES IT SAY THE GET WINDOWS 10 APP IS RUNNING OR ENABLED WHEN I DON'T SEE THE ICON? It is possible for the GWX app to be running but not actually displaying its icon. This is a result of various settings on your PC and the program's own internal rules/behaviors. Trust me, though, if GWX Control Panel says the app is running, it is running. 6. WHY DOES IT SAY THAT AUTOMATIC WINDOWS 10 UPGRADES ARE ALLOWED ON MY PC, AND HOW DO I FIX IT? 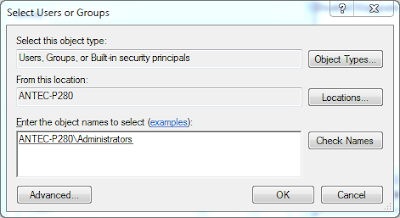 In the above example, GWX Control Panel discovered that the DisableOSUpgrade registry setting was missing. You might see different values there, depending on the state of your PC. There are a bunch of different settings that can potentially trigger this field to indicate Yes, and they're both used and maintained by a variety of operating system components. There are a few known causes for getting this indication. The DisableOSUpgrade registry value doesn't exist in a fresh Windows install; you have to add it yourself (GWX Control Panel can do this for you). So its absence will trigger the alert. Microsoft occasionally pushes updates to Windows Update itself. Sometimes these updates wipe out some of your existing Windows Update settings (many of which are directly related to Windows 10 upgrades), and you need to reset them with GWX Control Panel. To put your system back to "No" state, click the Prevent Automatic Windows 10 Upgrades button. Consider adjusting your Windows Update settings and/or using the Delete Windows 10 Programs feature of GWX Control Panel if you'd like to stop Windows from altering these settings while you're not looking. 7. I RECENTLY USED GWX CONTROL PANEL TO PREVENT AUTOMATIC WINDOWS 10 UPGRADES BUT NOW IT'S SAYING THEY'RE ENABLED AGAIN. WHAT HAPPENED? Please see the answer to the previous question. Chances are the "Delete Windows 10 Programs" feature will stop this behavior. 8. I USED GWX CONTROL PANEL ONCE TO REMOVE MICROSOFT'S 'GET WINDOWS 10' ICON FROM MY TASKBAR BUT NOW IT'S BACK AGAIN- WHAT HAPPENED? If you have Windows Update set to "check for updates but let me choose" or "download updates but let me choose" and you use Windows Update's "hide" feature to prevent KB3035583 from showing up in your control panel, that's only good for that particular version of the KB3035583 patch. The next time Microsoft pushes a new version of it, the new version of the patch will appear once it is available and need to be re-hidden if you no longer wish to see it. So, this is a really nasty update, and if you are not vigilant about which updates you install or how you install them, it will keep coming back, eventually. The point of GWX Control Panel is not to prevent Microsoft from installing software that you let it install via your Windows Update settings- it's to let you know when Microsoft installs things or changes settings that leave you vulnerable to Windows 10 and let you fix it. So, if you want to keep installing Windows updates (and any Windows computer that connects to the Internet should), leave your updates enabled and also enable GWX Control Panel's Monitor Mode feature. This will alert you when and if Microsoft changes anything behind your back so you can put things right again. 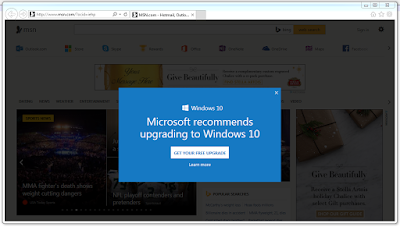 Some Microsoft sites (most notably MSN.com) have been displaying some very annoying advertisements for Windows 10 inside desktop web browsers for some time. I've seen the ads take two forms: A banner at the top of the browser window, and an even more annoying blue pop-over ad that you have to dismiss in order to see the web page underneath. 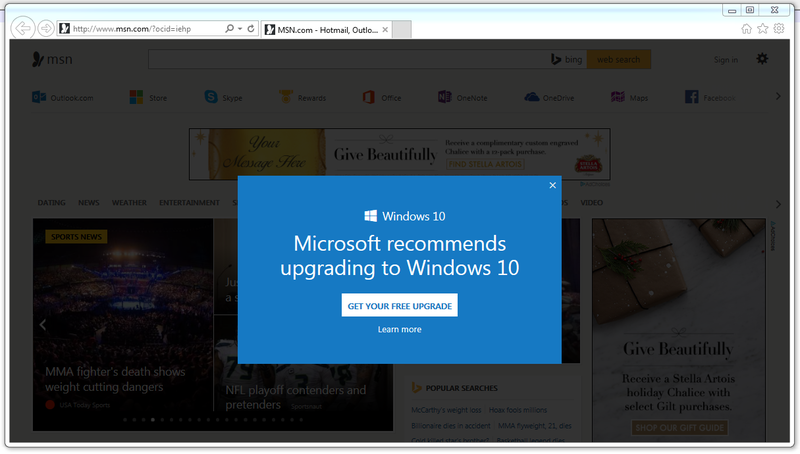 Both ads say "Microsoft recommends upgrading to Windows 10." GWX Control Panel is not yet able to inhibit the "Microsoft recommends upgrading to Windows 10" banner ads in Internet Explorer, Firefox, Chrome, etc. but this ability might appear in a future release. This is another example of the annoying MSN "Microsoft recommends upgrading to Windows 10" ads that GWX Control Panel does not (yet) fix. Investigation on how to stop this behavior is ongoing. On a related note, I am still looking for information on a new kind of Windows 10 notification that Microsoft appears to be pushing out. If you have ever experienced the kind of Windows 10 desktop pop-up shown in the following picture, would you please let me know if the "Prevent Windows 10 Upgrades" feature of GWX Control Panel fixes that problem? I have never seen that notification on one of my own systems, so I am unable to test it. Have you seen these pop-ups? Please let me know if the "Prevent Windows 10 Upgrades" feature fixes it! This is less likely to happen with version 1.7.0.2 of GWX Control Panel than with previous versions, but it's still worth documenting. Version 1.6 of GWX Control Panel enabled Monitor Mode on a per-user basis. In other words, you had to enable it for each user account on a given PC. 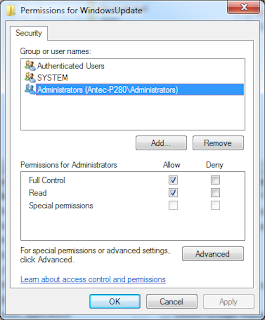 This turned out to be a problem, because there are situations where users with Standard or Child user accounts actually run the program with the account permissions of an administrator user on that computer, meaning that any user-specific changes the program made actually affected the administrator account, not the true current user account. 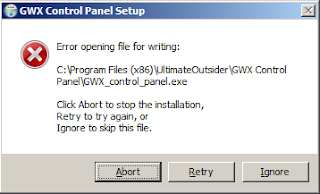 User with a Standard or Child user account installs GWX Control Panel using the GwxControlPanelSetup installer. In order to run, the installer needs administrator permissions, so it prompts the user for the password to a local administrator account. Once the password is entered, the installer runs under that administrator user's account profile. The installer launches GWX Control Panel once setup is complete. This instance of GWX Control Panel is still running as the Administrator user, since the installer that launched it had administrator permissions. User enables Monitor Mode in this elevated instance of GWX Control Panel. This does start the Monitor Mode icon for the current windows login, but the registry value that loads Monitor Mode on Windows restart is actually set in the administrator user's account profile. After restarting Windows, the Standard/Child user who enabled Monitor Mode doesn't see the Monitor Mode icon. 11. I SEE THE MONITOR MODE ICON IN MY NOTIFICATION AREA, BUT GWX CONTROL PANEL IS SHOWING ME THE "ENABLE MONITOR MODE" BUTTON INSTEAD OF "DISABLE MONITOR MODE"
The button status changed to reflect that Monitor Mode is now enabled for all users. Notice that GWX Control Panel Monitor Mode status now shows that it's enabled both system-wide and for the user named AnyPoint. This is actually harmless (only one Monitor Mode instance runs per user), but you can clean it up by using the Enable/disable Monitor Mode for current user option in the right-click pop-up menu of the program's title bar. Remember: There are situations where an instance of GWX Control Panel launched by a Standard/Child user actually runs under the profile of an administrator account. So just like with version 1.6, the Enable/disable Monitor Mode for current user option in the system menu might affect the administrator account, not the actual current user. This is why I display the name of the user Monitor Mode is enabled under, because it will list the administrator's name if the program is running with elevated permissions. The program versions displayed in the About GWX Control Panel and Check for updates dialog boxes are pulled from the currently-running process (they're not hard-coded strings built into the dialog boxes). If you see an older version listed in those screens, it means you're actually running an older version of the program. GWX Control Panel was downloaded three times, resulting in three uniquely-named files. The Enable Monitor Mode feature of GWX Control Panel tells Windows to use the path and filename of the currently running copy of GWX Control Panel when you clicked the button. If you enabled GWX Control Panel while using a different folder or filename from the most recent copy you downloaded, your other, older copy is going to be the one that loads on Windows startup. The GWX Control Panel installer solves this issue by letting you select a single install location for the program and replacing older copies with the latest version, preventing multiple copies from cluttering up your downloads folder. If you still prefer to stick with the stand-alone version, just click Disable Monitor Mode, then click Enable Monitor Mode to re-enable it using the current path/filenname. If you upgraded from version 1.6, you might also want to use the Enable/disable Monitor Mode for current user feature to make sure you don't have two startup entries for Monitor Mode (this will ensure that only the latest version gets launched at startup). 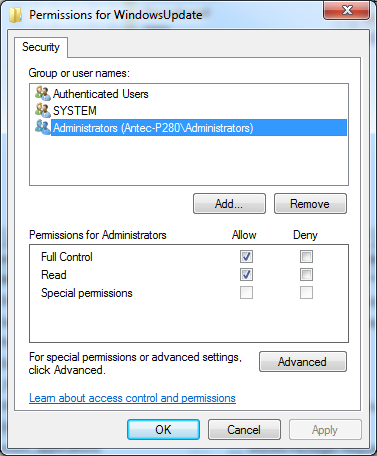 Standard user A uses a GWX Control Panel feature that affects system settings, resulting in Windows prompting for an administrator password. Any subsequent actions the user performs in that same elevated instance of the program, including Display the User Guide, happen under the administrator user B's profile. So, what's happening here is you're actually seeing the administrator user's browser settings. Just quit GWX Control Panel and launch it again to run with your own user account permissions. Any time Windows asks you to enter a password in order to use GWX Control Panel, it means you are using a Standard or Child account with limited Windows permissions. While this is expected if you launched GWX Control Panel manually and clicked one of the features that changes system settings, this is never supposed to happen at Windows startup, because Monitor Mode doesn't require administrator rights. GWX_control_panel.exe is located in a protected folder location. Standard and Child user accounts of Windows don't have access to all locations of a computer's storage drives. If another user downloaded GWX Control Panel into a protected or private location and enabled Monitor Mode, users who don't have the same access to the computer can be prompted to enter the password of an account that does. Someone changed the properties of GWX Control Panel to require administrator access. There are a lot of Windows utilities that don't work properly unless you explicitly launch them with administrator permissions. GWX Control Panel is not one of them. If you change GWX Control Panel's properties to elevate it to administrator, this will force Standard and Child user accounts to enter an administrator password in order to run it, even though Monitor Mode never does anything that requires admin rights. 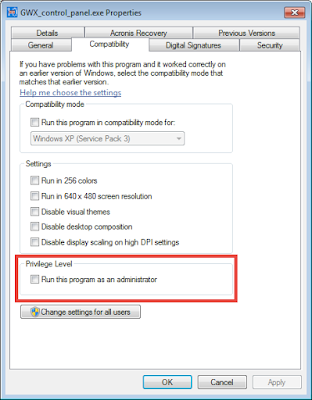 You never need to check this box or use the "Run as Administrator" Explorer shortcut menu option with GWX Control Panel. In both of these cases, the best way to deal with it is to use the GWX Control Panel installer. It will put the files in a place all users have access to and won't apply unnecessary elevation requirements to its executables or shortcuts. You will also want to be sure to disable/re-enable Monitor Mode after installing to make sure Windows loads the correct version of the program from the right location. More than one user account is currently in the logged-in state on your computer, and at least one of those other accounts is running an instance of GWX Control Panel (either the main program window or the Monitor Mode icon). You are running the installer from a Standard or Child account, and as a result the installer (which runs under a separate administrator account's credentials), can't "see" processes running in your Standard/Child account's process space. Launch the GWX Control Panel setup program (or uninstaller) and proceed. If you have Monitor Mode enabled, right-click the Monitor Mode "10" icon in your notification area and then click Reset Control Panel Window Position on the pop-up menu. If you don't want to (or aren't able to) use Monitor Mode, you can fix the problem by either uninstalling and then re-installing GWX Control Panel (assuming you used the installer versus running the program stand-alone) or by downloading and installing the most recent version of the GWX Control Panel installer. 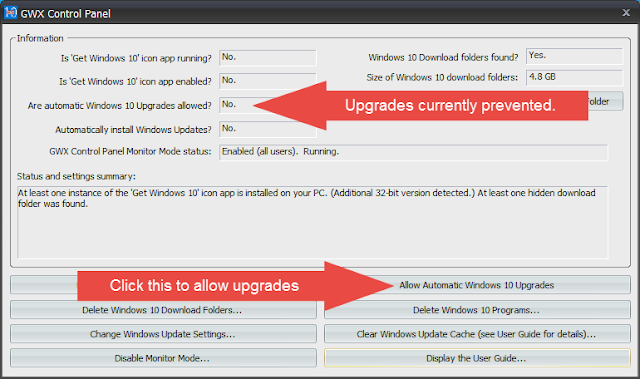 Beginning with 1.6.0.1, the installer resets the window position before installing/upgrading the program. Important note for Windows 7 users: There are known issues with the speed of "Check for Updates" in Windows 7. Before you start with this checklist, make sure you have the latest patches from Microsoft that fix known slowdown issues. I have written a separate article about this which lists the exact patches you need to download and install. This does not affect Windows 8. Wait it out. If your issue is that checking for updates is taking an unusually long time, understand that checking for updates is a queued operation. In other words, when you click "Check for updates" Microsoft puts your request in a queue behind hundreds or possibly thousands of other computers waiting to communicate with your nearest Windows Update servers. Busier times of day usually result in longer wait times. Also remember that if you used the "Clear Windows Update Cache" feature of GWX Control Panel your first update check will take longer than usual. Restart Windows. Seriously, if you haven't rebooted your computer since you first experienced your issue, please do it at least once. Try again later. The number one cause of errors when checking for new Windows updates is server problems, and Microsoft's update servers are busier than ever now that they're also used to distribute Windows 10. Note that most of these failures occur on Monday (when people power on their work computers) and Tuesday (when Microsoft pushes out most updates). Check your internet connection. Windows Update communicates with Microsoft's update servers, and it obviously won't work if your Wi-Fi connection is down or your router's not working, or your DNS cache is out of date. Unfortunately, the errors you get when this is the problem are incredibly misleading. Make sure the Windows Update and Software Protection services are running. Both of these services are supposed to start automatically with Windows, but they are "Delayed Start" services that load after all the other services start. Every once in a while one or both of them doesn't bother starting at all, and Windows Update won't work without them. Open up your Services control panel (services.msc) and locate Software Protection and Windows Update, then make sure they're both enabled as "Automatic (Delayed Start)" and that they're both running. While not as commonly a problem, you should also check that both Background Intelligent Transfer Service and the Cryptographic Services are enabled and running. Windows Update can't fully function without them. Check your Windows update log for errors. Locate the Windows Update log file (usually C:\Windows\WindowsUpdate.log). It is a normal text file you can open in Notepad. Any recent activity and error messages will be down at the bottom of the file. This will give you some keywords to search for when tracking down a fix. 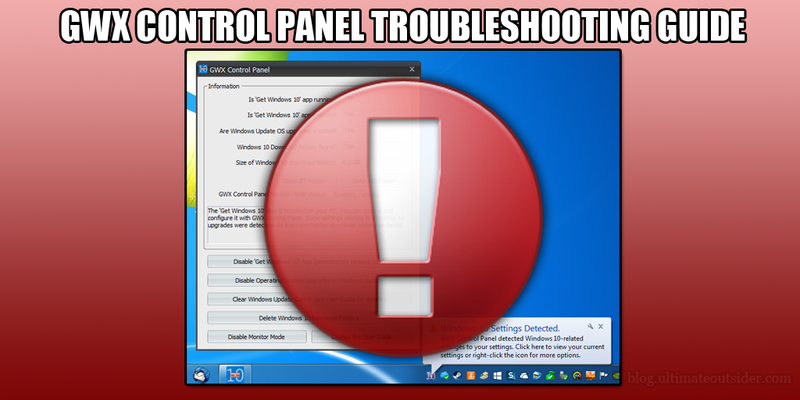 Try some of Microsoft's Windows Update troubleshooters. The first one I'd try would be the one located at the bottom of this Knowledge Base article. (Look for the "automatic troubleshooter" link.) If that doesn't seem to work for you, proceed to this other troubleshooter. Try a third-party repair tool. While I haven't used this tool personally, I have heard positive reviews from some folks who were able to able to resolve Windows Update issues with Tweaking.com's Windows Repair utility. If you do a Check for updates and Windows Update reports "No updates available" that really means that no updates are available (unless you've explicitly hidden some with the Hide update feature, in which case you can reveal them with Restore hidden updates). The Prevent/Allow Automatic Windows 10 Upgrades feature affects some Windows Update settings directly related to the Windows 10 upgrade process, and these settings are completely reversible. See the user guide. The Change Windows Update Settings feature presents a subset of the Windows Update settings for your computer. Any changes you make here will be reflected in your Windows Update control panel, and can be undone/changed back in either Windows Update or GWX Control Panel. See the user guide. The Clear Windows Update Cache feature deletes cached Windows update data and results in some one-time effects which are documented both inside GWX Control Panel (before you attempt to perform the operation) and at the GWX Control Panel announcement page. Among other things, the first time you check for updates after using it will take significantly longer than usual, but any actual errors you encounter are more likely due to server issues- so just try again later. 18. GWX CONTROL PANEL SUCCESSFULLY BLOCKED WINDOWS 10, BUT NOW WINDOWS UPDATE SAYS I'VE GOT A TON OF UPDATES READY FOR DOWNLOAD! Before allowing Windows to install your available updates, I advise checking your Windows Update settings (you can do this from within GWX Control Panel or by clicking Change settings from Microsoft's Windows Update control panel) and making sure to uncheck the option labeled, "Give me recommended updates the same way I receive important updates." This prevents Windows from automatically selecting non-essential patches such as KB3035583 for installation, and cut down on the number of updates you'll initially have to install. Some Windows Update patches conflict with one another in the sense that they make their own updates to the same operating system files on your PC. Windows is smart enough to apply the right changes when you install individual updates one-at-a-time, but if you attempt to install two or more conflicting updates together in a batch of other update patches, it is quite common for one of the conflicting patches to fail- which usually has the unfortunate effect of rolling back the entire batch of attempted updates. If you find that Windows keeps trying (and failing) to install the same updates, click the "important updates are available" link from the main Windows Update page, and then uncheck all automatically-selected updates except for one single update. Click OK to return to the main Windows Update page, and then click Install updates. Repeat this process, restarting Windows when prompted to do so. This may take a while, but it works. People frequently ask me if GWX Control Panel will prevent any Windows 10-related updates from downloading to your PC. The current version doesn't do that (you can read more about why this is- and why it doesn't really matter- in the first topic at the GWX Control Panel FAQ), but don't worry! If you've already used the "Disable/Prevent Get Windows 10 App" and "Prevent Windows 10 Upgrades" features of GWX Control Panel, you are already protected from Windows 10, regardless of what Windows Update patches you install on your PC. If you continue to experience problematic Windows Update behavior, have a look at topic 17 above, on this same page. I've never seen a Windows Update problem those steps couldn't fix. - Monitor Mode is enabled for all users in registry (HKLM Run GwxControlPanelMonitor). - Monitor Mode is currently running. - Monitor Mode is not currently running (try Restart Monitor Mode from the system menu). This is just a minor bug in the 1.7.1.0 code that parses the flag values. If the Flags value is 0x00000003 or 0x00000006, the "Monitor Mode is not currently running" message is incorrect. It will be fixed in the next version. Using "Run as Administrator" when launching GWX Control Panel (not necessary or recommended). When GWX Control Panel is launched by the installer. User modified the shortcut or EXE properties so that the program always runs as administrator (again, not recommended or required). 21. I USED GWX CONTROL PANEL AND NOW MY (INSERT APPLICATION OR FEATURE HERE) DOESN'T WORK! Open GWX Control Panel and re-enable any feature that you had previously disabled within the program. (And restart Windows if the program prompts you to do so.) This will undo any changes GWX Control Panel made, restoring them to their state before you ran the program. If you suspect Monitor Mode is causing problems, click Disable Monitor Mode in the main GWX Control Panel window to exit the Monitor Mode process and prevent it from starting automatically. Finally, if you want to completely rule out GWX Control Panel as a root cause, and you used the GWX Control Panel setup program to install the software (versus downloading the program stand-alone), you can uninstall it from your Programs and Features control panel in Windows. The uninstaller should stop any open instances and remove any registry values created by the installer and the application. If you reverse GWX Control Panel's changes and uninstall the application and you still have the issue, it's very likely that GWX Control Panel wasn't the actual cause of the problem. If, however, you do these things (reverse changes and uninstall) and your problem goes away then I definitely want to hear about it so I can research the matter further. You can leave comments here or contact me through the Ultimate Outsider Facebook page. I installed GWX Control Panel and donated. Thanks for making this available. Recommended by Steve Gibson on Security Now on the Twit Network. On reboot the Icon was gone from notification area of the task bar. Had to go to C:Program Files\ultimateoutsider and make a short cut. Then click the short cut to make the program run. Is this normal? Or was the program running and I couldn't tell? Could you add a short cut creation upon install? How to make the program run at start up in the monitor mode? Do you recommend this? If it says "Enabled, not running" you can kick-start monitor mode by clicking the icon in the upper-left corner of GWX Control Panel and clicking Restart Monitor Mode. It is running correctly after I read your reply and did a reboot. I noticed when I log in under an alternate administrator account (or any other account, for that matter), I don't see the GWX Control Panel icon in the taskbar, nor does the GWX Control Panel application show up under All Programs. All PCs/laptops are running Windows 7 Pro. But if I search for the application under C:\Program Files (x86)\UltimateOutsider\GWX Control Panel and execute it, options set under the previous account appear to be set with the current account. The one difference is I need to Enable Monitor Mode in order to see the GWX Control Panel icon under the alternate account. To enable monitor mode on the other account, just launch GWX Control Panel from the start menu shortcut and enable monitor mode from there. The start menu shortcuts SHOULD be available for all accounts, but I don't remember whether I ever tested this myself. @Ultimate Outsider - The start menu shortcuts only appear for the user who installed the application. It's not in the start menu shortcuts even for another administrator account on the same PC/laptop. I have installed this on three PCs and two laptops (all Windows 7 Pro), and they all exhibit this. But as I indicated, it will run under its installed drive location, and the Monitor Mode can be set from there. Thank you for confirming that each user will be required to activate the Monitor Mode, if desired. @m04f04m - Thanks for the update. Yeah, I'd like for the shortcuts to be available to all users, even though I'd like to keep settings/preferences on a per-user basis. Will probably tweak the installer script to do make sure the shortcuts are system-wide. It would be nice if there was an option to run it in some sort of administrative mode for all users where the Admin decides for all users on the system. Maybe have it run it as a service under local system. I can see this being good on home PC's where kids who like to click on things cant change the settings. "This update is provided as an Optional update on Windows Update." But on my PC (lokalized for Germany) it comes as a importand update and not as Optional. @Jan - Here we go again! I will take a look at it this weekend. Thanks! Hi, I installed GWX Control Panel a few days ago and disabled the "Get Windows 10 App" and disabled Windows 10 Operating System Upgrades. I did Windows 7 updates yesterday and de-selected KB112343 since it was a Windows 10 related, then re-started my PC. Everything was OK.
Then today I manually did Windows Update (I have it set to not download or install automatically) and installed KB 112343. When Windows 7 re-started It gave me an error window saying it couldn't find the Desktop location, the Desktop was in classic display mode, all of my Desktop icons were gone, and I couldn't find Windows Explorer in All Programs Accessories. To troubleshoot, I manually found the GWX Control Panel .exe, launched it, and toggled the options I had selected previously. I then rebooted. Everything was back to normal. I then launched GWX Control Panel using the desktop icon and re-toggled the selections again, re-started and everything was OK.
Just a weird occurrence that I thought you and other users should be aware of. The version that have downloaded shows as 1.3.0.0. It seems simple enough. If I haven't had any problems since initially downloading this, would you suggest leaving it as is? Granted I also haven't installed any Windows updates in a while, so... I don't know. I'm not as tech savvy as I'd like to be, so I don't really know what all I'd be getting into if I upgraded to the latest version of GWX. It seems like this "Monitor Mode" might cause some issues. What exactly does it do, and is there a way to make sure that it isn't turned on? Do forgive me if I'm missing the obvious. @Mark - Monitor Mode is completely optional and elective. (And it doesn't cause any problems. I just learned of- and fixed- some confusing behavior with it that only affected users with particular kinds of configurations that I didn't originally anticipate when writing the program.) I finally updated the user guide for the latest version. There is a Release Notes section that lists every single feature and enhancement added since version 1.3. Have a look at that to help decide whether you think you'd benefit from the newer version. Alright, I'll take a look here soon! I did want to make a suggestion though, for people like me. Would it be possible to create a list detailing all of the particular patches having to do with W10? I noticed that Tom up there said that he purposefully didn't select KB112343 due to it being Windows 10 related. I'm well aware that there are probably hundreds of sites out there that already do this, but with a program like yours - which I consider vital - I thought it couldn't hurt to ask! @Mark - It's a good suggestion and something I've been thinking about for a while. I'm either going to put something like that together soon or point folks to a trusted source for that info. It seems at least on the January Patch Tuesday MS did not pull any new tricks on Win7 users. KB3035583 was uninstalled and hidden earlier twice by me, this time it stayed away. BTW MS published an extensive list of recipes for blocking their own Windows10 actions for good. After looking through these complicated type of "IT admin" actions and scripts, I can only conclude the GWX Control panel does the very same job for you! @donthuis - Yes, that Microsoft article has been around for several months, but until this week half of it was simply wrong. They finally fixed it once they announced their plans to force the Get Windows 10 app on small businesses. GWX Control Panel was already doing everything in their current/correct instructions since version 1.3, though- and my recent versions of course do a lot more! "It seems at least on the January Patch Tuesday MS did not pull any new tricks on Win7 users. KB3035583 was uninstalled and hidden earlier twice by me, this time it stayed away." I wish I could say the same. KB3035583 showed up again, un-hidden and rechecked for installation on every PC and laptop we own (all running Windows 7 Pro). I even had KB2952664 show up again on one of our PCs. I have each PC and laptop notify me of any Windows updates *prior* to downloading because I am paranoid. Seems that paranoia is warranted. I have been double-checking the recommended list to make sure no suspicious updates make their way into the list before downloading and installing them. Kind of bothersome when there are 20 or so updates that happened earlier this week. @m04f04m - If you let KB3035583 install but then use the "Delete Windows 10 Programs" feature of GWX Control Panel, this will at least keep the patch from re-appearing on your system until the next time Microsoft pushes an update to the patch. If you actually uninstall the patch, it will show right back up in Windows Update and install eventually unless you explicitly hide it first. KB3035583 was not installed on any of our systems, and I had explicitly hidden it, along with KB2952664. I thought that was suppose to keep Windows update from adding them to the list of updates, but that's not what happened this week. I had been hiding these two updates even prior to installing the GWX app, and it had stayed that way the past 5 weeks or so after the app was installed. I was mad (but not surprised) it had showed up again. I figured this had less to do with the GWX app as it did with Microsoft. Honestly, if I could move to LINUX, I would do it. I'm getting tired of Microsoft. Hi. I installed GWX on a Windows 8.1 laptop and made the proper changes with it (I think)... "No traces of the Get Windows 10 app, Windows 10 upgrade settings, or Windows 10 installation files found. You appear to be safe!" I then ran Windows Update and yet it shows KB3123862 and KB2976978 available for download which I believe are related to Windows 10 updates. I thought GWX was suppose to deal with that issue and prevent those updates and other updates tied to Windows 10 from appearing? I still had to select these updates and hide them manually. So, I don't see what the point of GWX is if I still have to research these KB's and manually hide them. Please fill me in on this. @Joe - Those patches you mentioned do not (as far as I know) cause any Windows 10-related symptoms or behaviors that are actually visible to end users. The purpose of GWX Control Panel was to let users control and fix visible Windows 10 problems like removing the "Get Windows 10" icon, blocking Windows 10 upgrades, deleting hidden Win 10 download folders, restoring the Windows Update control panel to normal behavior, etc. So at least for the moment, the program doesn't think in terms of "which Windows Update patches are currently installed?" as it does "which settings and files that cause known Windows 10 problems are present?" You can check out the "What it does and how it works" section of the user guide for a detailed list of everything my program does and doesn't do. If either of the two KB patches you mention is found to actually cause real user-facing problems, then I'll update my program will deal with them. All of the above said, the next version will include optional logic that addresses some of the more nebulous updates like KB3213862, but I will continue to honor end user Windows Update settings. Have you heard about the new registry entry? Oh sorry, the wrong one. Just this week I've got into installing operating systems from thumb drives. After trying half a dozen usb image makers I've settled on 'Rufus' http://rufus.akeo.ie. As a Windows app, I run it in Windows 7. Three times when I've started it, GWX Control Panel alerts on "Windows 10 files or settings detected'. The icon throbs until the interface is brought up, at which point - with all fields negative for said detections - it stops. Close and open 'Rufus' again and there is no FP; but stop and restart GWX Control Panel then close and open 'Rufus' again, and it FP's again. I downloaded GWX control Panel and removed windows 10 files.The icon showing windows 10 upgrade disappeared but I still get 'Restart your computer to finish installing important update" message and has to postpone it for every 4 hours.And in "Update History" I still get KB 3035583 as successful.Does that mean that file is still there? ?But it is not there in "View installed updates". I've been running monitor mode for some time, then a couple of days ago I get a popup, and see that my "Are Windows 10 Upgrades allowed" has switched to "yes". Clicking on "Prevent Windows 10 Upgrades" has no effect on this. Everything else is where I want it to be e.g. got rid of the app and download folders. Is this something new? Can I fix it? is it even a problem? @Mike - Please send me your "save diagnostic info" report. This is a menu option you can get by right-clicking the program's title bar or the monitor mode icon in your notification area. I'm not quite visualizing what you're describing but that log will help. My email address is at the top of the generated report. OK I sent the diagnostic report and screenshot. I cannot get rid of the "yes" in "Are windows 10 upgrades allowed"
I really dislike your program auto loading its homepage in my browser. Short of uninstalling it, how do I stop your program from hijacking my browser page? @ebookreader4ever - My program doesn't do anything in any browsers, and I actually can't even imagine what you could be experiencing. Can you show a screenshot of what you're talking about, or can you at least describe what you're seeing and when you see it? I installed GWX on 26 March. I want to update my system (Win 7) for usual security updates. I selected the updates as none of them looked suspicious and asked for the updates to start but all I get is "Preparing to Install" which has been on the computer for hours and never changes. I looked on Task Manager and that says Windows update 1580k memory, but no CPU activity. I re-started the computer and also restarted Window Update but still nothing after several hours. I know you said it could be slow after protecting your computer as the cache has been cleared, but it is just doing nothing, so what do I do now? n.B. I am not much of an expert at computers, so please explain simply. Attempts to download latest version of GWX Control Panel fail with error 12031. Pausing Kaspersky antiviral/firewall protection had no effect.